Feelunique leverages Bazaarvoice Curations and consumer-generated photos to give consumers the confidence to buy. Create a compelling digital shopping experience while supporting the retailer’s rapidly-growing catalog of products. Leverage ratings and reviews and photos shared by customers on social channels by gathering the content and displaying it on the retailer’s site. Collected more than 52,000 syndicated reviews from brands and photos from more than 1,250 users, generating hundreds of thousands of additional site interactions. Across its galleries of curated social content, Feelunique saw almost 15% of viewers click through to Shop Now links. The beauty of authentic consumer photos: How Feelunique drives shopper engagement and conversion. Feelunique strives to give its online shoppers increased confidence to buy makeup, haircare, skincare and other beauty products online. The UK-based company addresses this objective by consistently improving the user experience across its site, including leveraging visual content shared by customers. “As a fast-growing business striving to keep customers at the center of everything we do, our consumer-generated content (CGC) program is a way for us to do that,” says Tom Newbald, Marketing & Customer Experience Director at FeelUnique. Bazaarvoice Curations captures and displays photos that customers and advocates are already sharing on social channels. “Visual content is key to helping convey someone’s experience of a product,” explained Newbald. “Makeup is highly visual and expressive, and there is already a wealth of fantastic imagery out there from customers who love using social channels to share,” says Newbald. By displaying consumer-generated photos alongside ratings and reviews, Feelunique offers a digital experience that increases consideration at key points in the conversion process. “Providing our customers with the ability to read reviews and see photos adds to the conversion rate, which in turn increases average order values and helps grow our business more quickly,” says Newbald. Curations content is displayed as a shoppable gallery and on individual product pages, and shoppers engage with both. From January to March 2017, Feelunique’s shopper gallery generated more than 675,000 views from site visitors, and 13% of viewers interacted by clicking to view more photos, opening them, or clicking on Shop Now links. “We see that people are spending longer on pages with reviews and photos and are more likely to convert,” says Newbald. In fact, shoppers who viewed visual content across the site converted twice as often as those who did not. 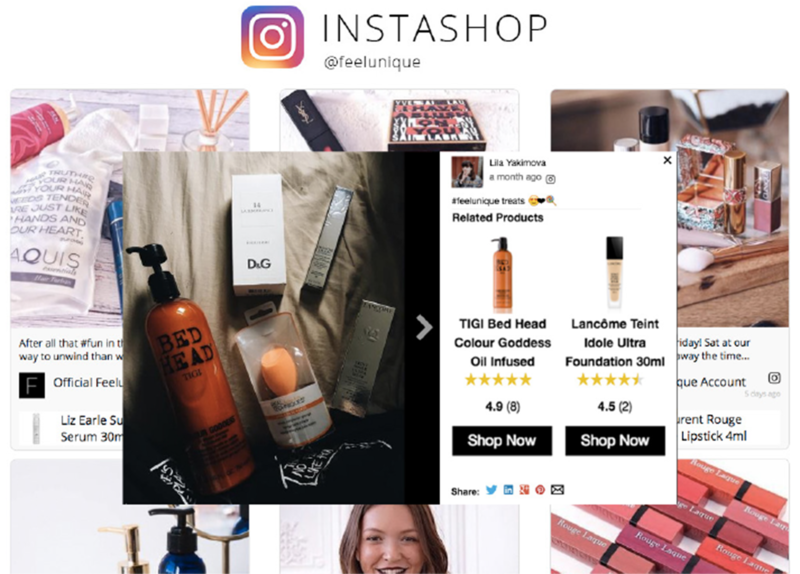 “Making social content shoppable is a key objective for us,” says Newbald. With products from 500 brands, it’s challenging to include rich content on every product page. “When you’re trying to scale a fast-growing business like ours with a massive catalog of over 20,000 SKUs, it’s a big task to add rich content to product pages ourselves,” says Newbald. The company used consumer-generated content to solve for this, as every new review or photo updates key pages with relevant and fresh content. This not only makes product pages more compelling, but adds SEO value. 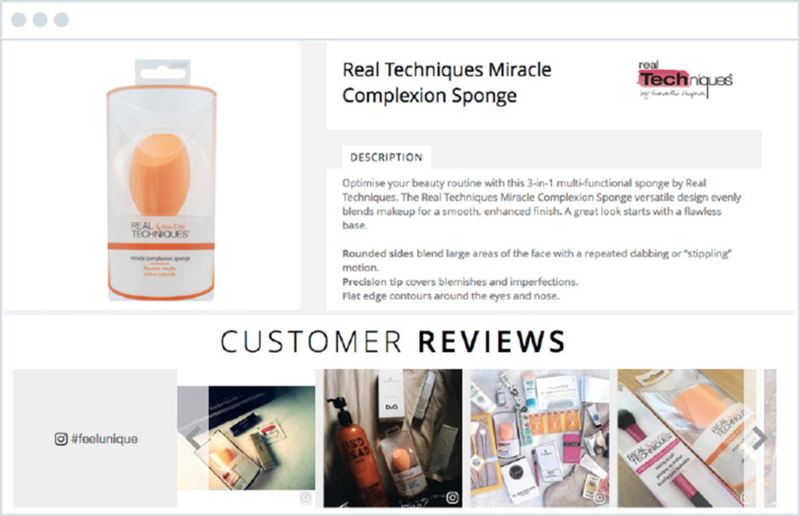 Collecting reviews from the brands also supports Feelunique’s coverage efforts, as the company benefits from Bazaarvoice syndication, which enables Feelunique to display CGC collected by their brands outside of their website. To date, syndication has added more than 52,000 reviews to the FeelUnique site. FeelUnique customer advocates primarily share their content via Instagram. Through Bazaarvoice Curations reporting, FeelUnique learned that 1,250 users have provided content featured on Feelunique’s site, with one advocate receiving 124,000 impressions and 1,600 interactions on the company site from just three Instagram posts. This reporting allows the company to identify passionate brand ambassadors. Feelunique also uses consumer-generated photos in its marketing and advertising material and plans to incorporate even more. “We have tested many different types of content, and visual content harvested from customers has proven to be more engaging and have higher click-throughs than professional or stock photos,” says Newbald. To provide shoppers with a positive online experience, Feelunique uses Bazaarvoice Curations to collect and display consumer-generated visual content. Along with ratings and reviews, the photos help drive site engagement and conversions for Europe’s largest online beauty retailer. We see that people are spending longer on pages with reviews and photos and are more likely to convert. The King of Shaves gains a competitive advantage using reviews to increase sales in retail channels and gather insights into the buyer and the customer experience. Burt’s Bees leverages consumer content to drive retail channel sales, gather insights, and launch new products with immediate success.